The U.S. Bureau of Labor Statistics releases occupational data once a year, as opposed to industry data which is available every month. The 2015 occupational data was released today, March 30th. 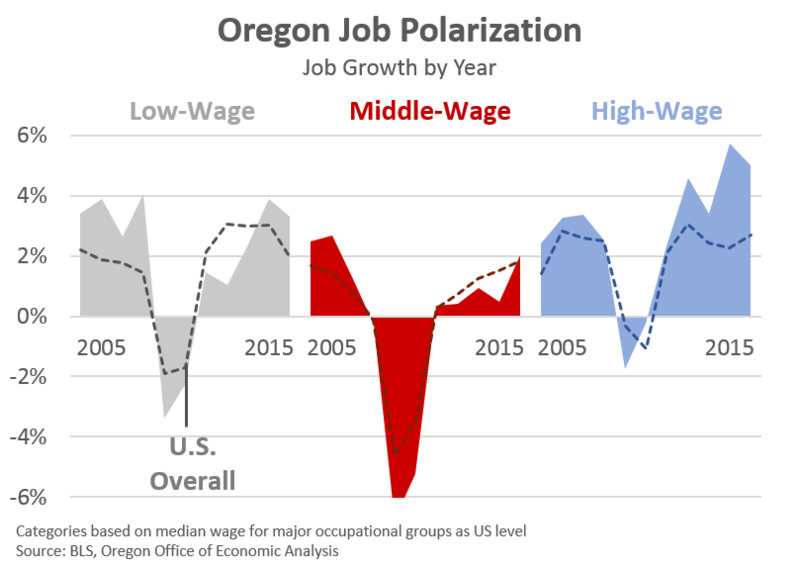 Below is brief update on job polarization in Oregon, which is where the majority of the job gains are concentrated in both the low- and high-wage occupations. Middle-wage jobs account for a declining share of the overall economy in recent decades. See our office’s 2013 report for a more thorough and complete look. The good news is that middle-wage jobs in 2015 grew at their fastest rate in a decade. Oregon’s gains of 2% even nudged ahead of the nation’s 1.8% increase. The bad news is middle-wage jobs continue to lag behind job growth in low- and high-wage occupations. This pattern is called job polarization. The best news on the job polarization front in recent years is that the employment growth is dominated by high-wage jobs. This is particularly the case here in Oregon and in our urban centers. Despite some of the rhetoric that it is a low-wage recovery, or all the jobs being added are bad jobs, high-wage gains outnumber low-wage gains. Middle-wage jobs, while growing again, remain considerably fewer than before the Great Recession. The bulk of these losses are in the traditional blue collar occupations of construction, installation, maintenance and repair, production, and transportation. In academic terms, these jobs are also called routine manual occupations. 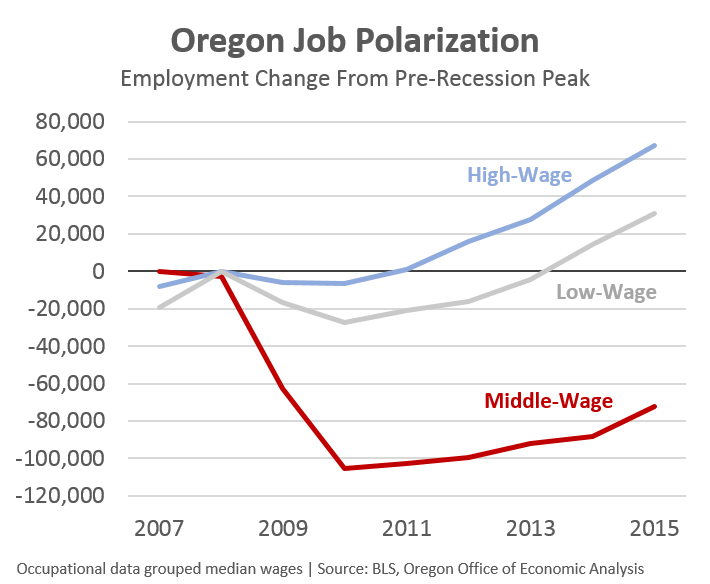 Either way, Oregon has approximately 62,000 fewer of these jobs today than before the Great Recession, or nearly 15% fewer, some six or seven years into the recovery. Office and admin support jobs have also seen tremendous declines over the past decade and remain 22,000 jobs below pre-recession levels. As has been the pattern in recent decades, middle-wage jobs decline the most in recessions and do not fully come back in expansions. Finally, the job gains are not evenly distributed across the state either. The vast majority of the state’s high-wage jobs are being created in the state’s metropolitan areas. 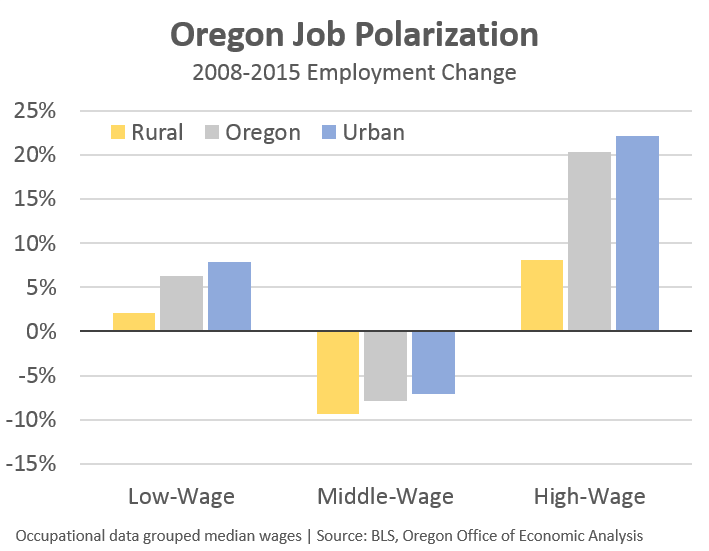 Rural Oregon is growing again (see our office’s report for more) and the polarization pattern is evident there as well. There are always warts to economic expansions. Early in this recovery the biggest issues were the long-term unemployed, lack of job gains in rural Oregon and the missing middle-wage jobs. These still remain the biggest issues today, however considerably less so than five years ago. The labor force participation rate is increasing and employment opportunities are booming. Rural Oregon is growing again, narrowing the Jobs Gap. And middle-wage jobs are coming back; they do not decline forever. However job polarization remains an ongoing process or outcome.